If this is true, then what does it mean for the chances of a Surface Book 2? Though deciding between the Surface Book and the Surface Pro 4 was an agonizing choice for PCWorld editors, customers apparently know what they want: The Surface Pro 3—yes, the older one. AdDuplex, a Windows-specific ad network which compiles data on Windows machines, estimates that an even third of all Surface users are using a Surface Pro 3, a convertible tablet Microsoft phased out when its successor, the Surface Pro 4, began shipping in late 2015. SP4 sales are closing fast, though: AdDuplex said they’re about 30.9 percent of all Surface tablets that it detected. The real mystery, though, is why Surface Book sales have been so slow: in fact, the firm puts its market share at just 3.6 percent of all Surface products. 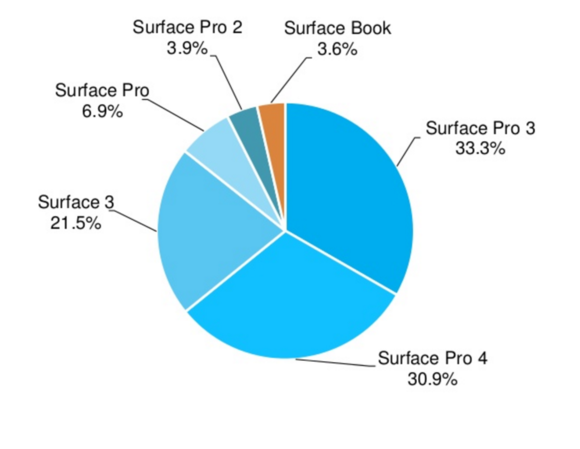 Not only are the SP3 and SP4 outselling the Book by roughly a 10:1 ratio, but the original Surface Pro (6.9 percent) still has almost twice the user base of the Book. This certainly looks like confirmation that we’ll see a Surface Pro 5, eventually. What this means: Lacking more specific numbers, it's unclear whether the Surface Book is unpopular or simply niche. We don't know how many Surface Books were produced compared to how many Surface Pros. AdDuplex noted that the Surface Book remains in limited distribution: In addition to the United States, it’s available in Austria, Australia, China, France, Germany, Japan, New Zealand, Switzerland, and the the United Kingdom. We’d expect price matters, too—the Book ranges from $1,900 to $4,300, while the Surface Pro 4 begins at $1000. 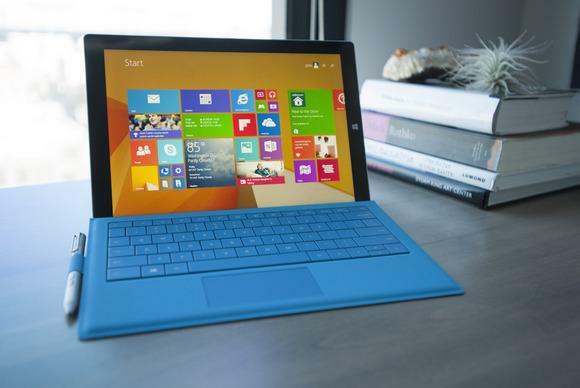 (Microsoft is even selling the $2300 Surface Pro 3 online again.) The Surface Book has also had a history of hardware glitches. A February update solved its “hotbox” problems, but its June 20 firmware update only promised to reduce the number of “unexpected shutdowns” while in a sleep state. AdDuplex also provided a snapshot of which manufacturers have sold the most Windows 10 PCs—not Windows PCs, but Windows 10 PCs—to date. Of the installed base of Windows 10 PCs, AdDuplex found that HP had manufactured the most, which nearly twice as many as Dell. 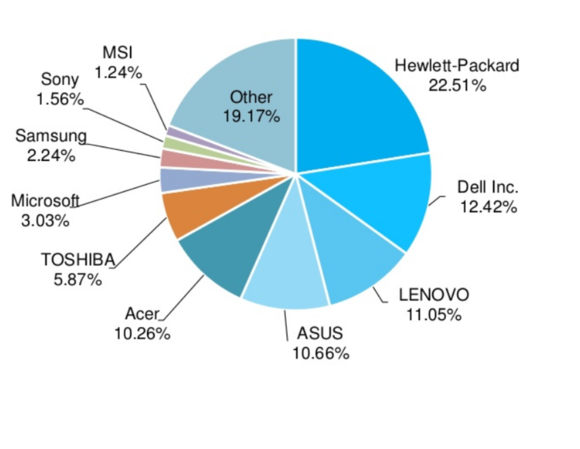 No real surprises here—HP, Dell, and Lenovo have been among the top PC vendors for years. These numbers are less suprising, if only because the rankings of top PC vendors change on a quarter-by-quarter basis, though familiar names clog the upper ranks. (During the first quarter of 2016, Lenovo, HP, Dell, Apple, and Asus shipped the most PCs worldwide.) If AdDuplex’s numbers are accurate, that means that HP would be Microsoft’s key partner in terms of pushing Windows 10, followed by Dell and Lenovo. Microsoft’s own significance as a hardware maker pales by comparison, as the firm is only seventh among its hardware partners. But Microsoft has said time and again that it strives to create new categories of hardware for its partners to own. Given the rather sizeable number of Surface-like convertible tablets we’ve seen from Microsoft’s partners, it’s clearly achieved this with the Surface line of tablets. As for the Book? It appears the jury is still out. The unanswered question this report raises is whether Microsoft will build a Surface Book 2. It seems unlikely that Microsoft would abandon the Book, given the massive amount of press coverage the original Book generated. If Microsoft always intended the Book to be a halo product rather than a mass-market success, that's one thing. But if sales are less than hoped-for, Microsoft might reconsider.